A whole chicken stuffed with garlic and butter. 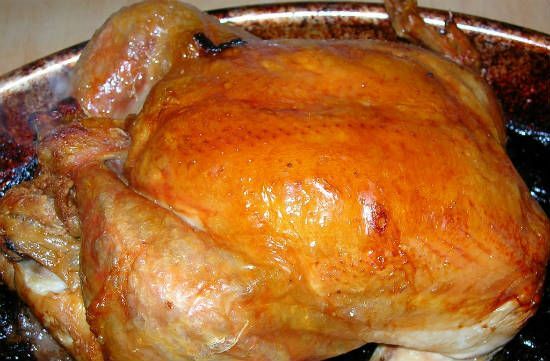 Cooked in a preheated oven until skin is crispy and juices run clear. 1. Trim and discard the excess fat, feathers and loose parts from the chicken. 3. Mix the butter with minced garlic, salt and pepper powder. 4. Stuff this under the skin of the chicken. 5. Stuff the garlic head into the cavity. 6. Rub the olive oil all over the chicken and sprinkle some salt and pepper on top. 7. Tie the legs and tuck the wings underneath the body. 8. Transfer to a baking dish and place it in a preheated oven at 425F for 60 to 90 minutes or until juices run clear when sliced and skin is crispy. 9. Remove and cool for 15 minutes. Feel free to comment or share your thoughts on this Garlic Roasted Chicken Recipe from Awesome Cuisine.